Bunions (Hallux Abducto-valgus) are a common deformity at the base of the big toe. A bunion is often described as a ‘bump’ on the side of the big toe with the same big toe deviating towards the second toe rather than pointing straight. A progressive disorder, the gradual leaning of the big toe changes the alignment and angle of the big toe joint and over years slowly produces the characteristic bump. In addition there is often a thickening of skin and tissues that may become inflamed and painful. Symptoms often appear at the later stages, although some people never get symptoms. 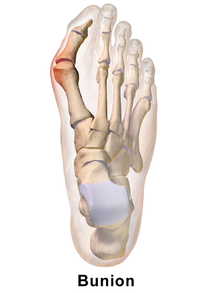 Bunions are a result of complex biomechanical changes that occur in your feet. Often blamed as ‘hereditary’, it is not the bunion itself that is inherited, but rather the foot type and/or causative factor that makes a person prone to developing bunions. For example, over-pronation of your feet can lead to higher forces through your big toe joint, increasing the likely-hood of a bunion. Ill-fitting shoes such as high heels and pointy end shoes (tight toe box) do not cause bunions. However, they do encourage the deformity to progressively get worse resulting in early onset of symptoms. Bunions are visibly apparent. However, to fully evaluate the condition, your podiatrist may request x-rays to determine the degree of deformity and assess changes that may have occurred. Many people unnecessarily suffer discomfort for years before seeking treatment. Unfortunately, bunions do not go away and more often than not, gradually get worse over time if not treated efficiently. This is why it is vital to see a podiatrist for treatment BEFORE symptoms and issues arise. Early treatment is aimed at stopping the progression of the bunion and easing the pain. Orthotic devices: As already noted, bunions are a result of abnormal foot biomechanics. This is why orthotic devices and padding in footwear is successful. Changes in shoe wear: Wearing appropriate footwear is very important. Footwear should be supportive and well fitted. Pointed toe shoes and high heels should be avoided. Medication: Anti-inflammatory drugs may be recommended to further reduce pain and inflammation. If the bunion deformity is too far advanced or if non-surgical treatments fail to relieve bunion pain and the pain interferes with daily activities, your podiatrist may refer you to a surgeon. There are a variety of surgical procedures available and the type of surgery is dependant on each individual case.